Friend and business owner, Hoyt Tuggle once said to me, “No one pays more for a product or service than they think it is worth.” That is the law of value, and here are a few of the selling corollaries that accompany it. When a buyer says, “Your price is too high,” they are also saying value is too low. To get your price, you will have to change their perception of value. Buyers don’t always buy the best available product or service, but they always buy the best value. 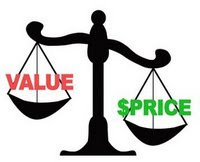 The best value balances benefits against price. Some benefits are necessary. Others are nice to have. The buyer will forego nice but unnecessary benefits when the additional cost is too high. Value is constructed from benefits. Benefits fall into two basic categories: functional benefits and emotional benefits. Functional benefits are tied to logical reasons to make a purchase. Emotional benefits relate to the buyer’s feelings. By asking questions, you determine what benefits the buyer wants and how much they are willing to pay for them.